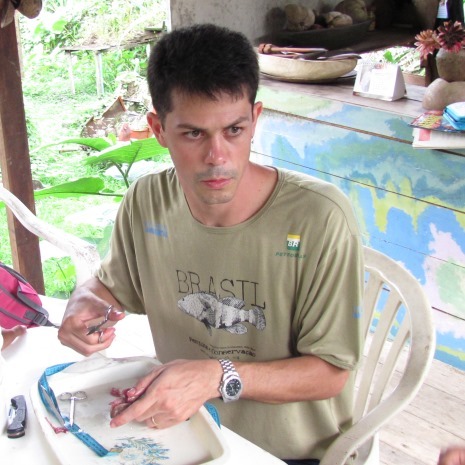 CLP alum Matheus Freitas has conducted two projects to identify where large numbers of commercially important yet threatened fish congregate in mass spawning aggregations. Through this work, the team have been able to successfully locate priority area for biodiversity conservation in the Atlantic Ocean. My concept of the CLP is the best possible. Much of this is due to the fact that CLP is not only a partner who financially support projects, but a partner who is interested in forming leaders enabling a fantastic exchange of experiences among researchers throughout the world. My research team and I have been greatly benefited with all the institutional support enabled by CLP. Our first project funded by CLP in 2004 enabled us to significantly improve our research actions in the Abrolhos shelf, Bahia, Brazil. As part of our two CLP-funded projects, two team members received training in conservation project management and leadership. The know-how acquired through this training allowed the team to broaden and diversify the possible actions that we could implement in our project together with local residents and the fishing community in Abrolhos. Certainly, without CLP support we wouldn’t have been able to achieve so many positive outcomes. Our first project resulted in a substantial advance in knowledge about the biology of groupers and snappers, which are the largest reef fish exploited by fisheries in the Abrolhos Shelf. Results from the initial project supported proposals for a new mangrove Marine Protected Area (MPA) and buffer zones for two existing coral reef MPAs. Our Follow-up Project in 2011 provided support for the expansion and adaptive co-management of the Abrolhos Bank MPA network. Sound scientific knowledge and broad community engagement are imperative in the management of new and existing MPAs. Through our CLP-funded projects we have been able to gather and disseminate important information from fish landing surveys, habitat mapping, and underwater assessments and share these with key stakeholders. The data collected during our two projects has provided the basis for capacity-building activities carried out with our partners. The beneficiaries of this effort since 2005 include four undergraduate students, three Masters students, and one PhD candidate whose projects included aspects of the ecology of several species of snappers and groupers in Abrolhos. The significant results of our work have been achieved with strong participation of the local community which has supported us in all phases of the project—from research to policy-making.